The Spring 2019 issue of Renaissance Quarterly has now published online, and the contents of the issue can be accessed here. For subscribers to the print issue, copies of the issue were mailed on 17 April 2019. 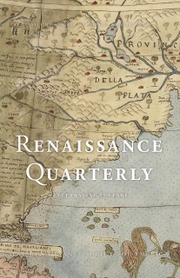 Renaissance Quarterly is the leading American journal of Renaissance studies, encouraging connections between different scholarly approaches to bring together material spanning the period from 1300 to 1700 in Western history. The official journal of the Renaissance Society of America, RQ presents about twenty articles and over five hundred reviews per year, engaging the following disciplines: Americas, Art and Architecture, Book History, Classical Tradition, Comparative Literature, Digital Humanities, Emblems, English Literature, French Literature, Germanic Literature, Hebraica, Hispanic Literature, History, Humanism, Islamic World, Italian Literature, Legal and Political Thought, Medicine and Science, Music, Neo-Latin Literature, Performing Arts and Theater, Philosophy, Religion, Rhetoric and Women and Gender.